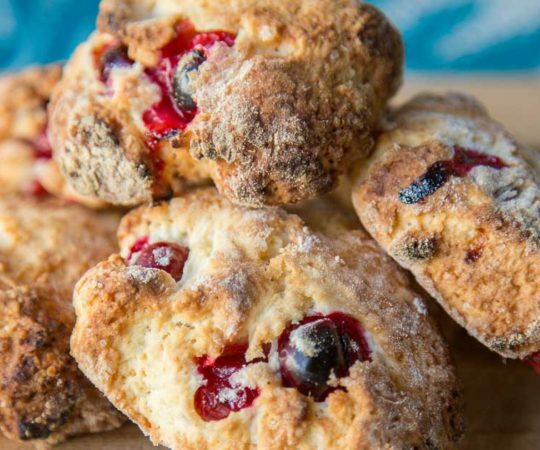 Comforting, crumbly scones are a popular breakfast food, especially alongside a cup of coffee. 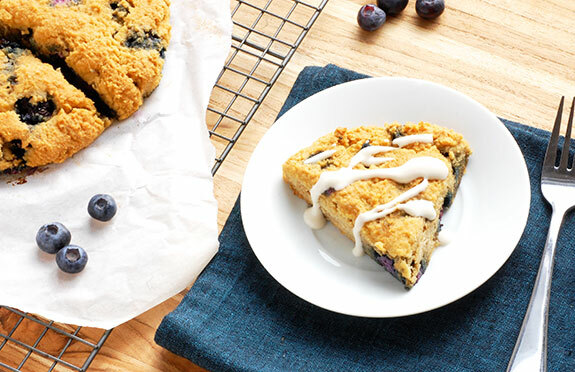 This grain free and Paleo blueberry scones recipe is easy to make and has a list of straightforward ingredients. This is Paleo baking at its finest. The dry ingredients are stirred together first. In a separate bowl, the wet ingredients can be whisked together. This includes the eggs, almond milk, maple syrup, melted coconut oil, and vanilla extract. Once the mixture is whisked, you can add in the dry ingredients. If the dough seems at all dry you can add in a dash more of almond milk. 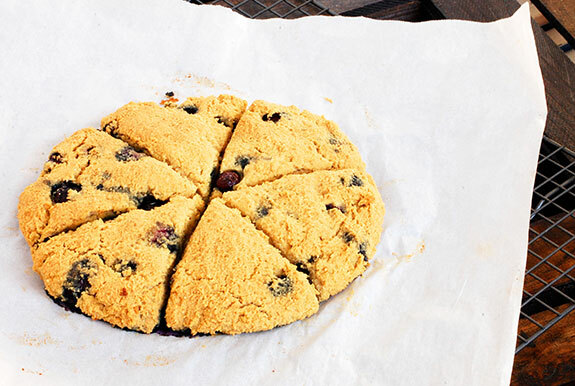 Once the dough is together, fold in the blueberries gently. Form the dough into a large ball, which I do with the help of a spatula. Then transfer the ball to a baking sheet lined with parchment paper. Flatten out the ball of dough into a wide flat circle, and use a sharp knife to cut six wedges. At this point the baking sheet can be placed in the oven to bake. The scones take about 25 minutes to reach a golden brown color. Watch closely to make sure they do not get too brown, and at the same time they should not be too soft in the middle. I think the scones are best when they are enjoyed warm right out the oven. However you could also make a batch to enjoy for breakfast throughout the week. The scones keep well in the refrigerator, and are still delicious reheated. I also decided to make a glaze for this batch of scones. It’s not necessary but adds a decadent topping. I simply whisked together coconut cream (skimmed from the top of a can of chilled coconut milk) with vanilla and maple syrup, tasting along the way until it reached a good balance. Instead of a glaze, you could also drizzle the scones with melted chocolate, or perhaps mix some lemon zest into the batter. 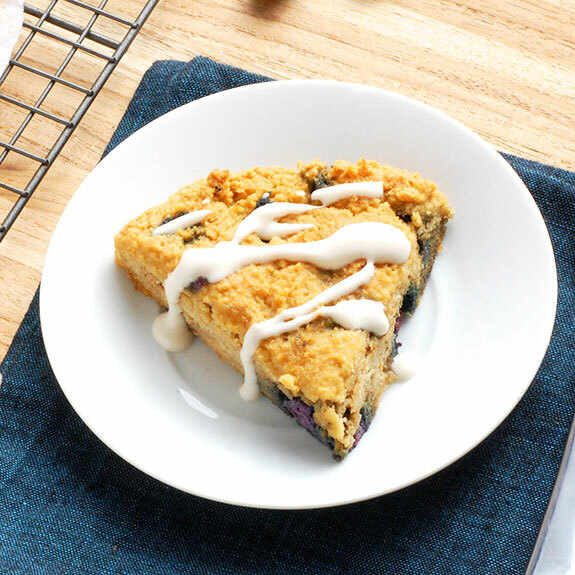 This is a breakfast treat that you’ll be making over and over again. Preheat the oven to 350 degrees F. In a large bowl combine the almond flour, coconut flour, baking powder, and salt. In a separate bowl, whisk together the eggs, almond milk, maple syrup, coconut oil, and vanilla. Line a baking sheet with parchment paper. Form the dough into a ball and place onto the baking sheet. Flatten the ball slightly, and carefully cut into six equal wedges. Bake for 20-25 minutes until golden brown. Does it work well to substitute coconut milk for almond milk? Thanks. First really excited to find this as have to make scones for son’s class party and am low on gf mix but what can I do to substitute coconut products (oil and flour) as have some issues with coconut? Can I use olive oil or vegan butter for oil and do 1 1/2 cups almond flour? Thanks. Could you supply a recipe for the glaze? be the brand of coconut flour i used. Also had to continue cooking for another 15 minutes at lower temp as the middle was still raw. Will have another try as love the idea of these. These are so fast and easy to whip up – and very tasty! The first time my batter was quite moist, possibly because I used flax “eggs” instead of real ones and almond meal not flour. But the second time I added flaked/shredded coconut and some cinnamon, and baked them an extra 5 minutes. Perfection!